Pet Calmer for dogs & cats is a great new product by Bradfield's Natural Pet Care. It helps to reduce anxiety, fear and nervousness in animals when traveling etc. 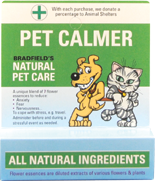 To find out more about this product go here Bradfield's Pet Calmer for Dogs & Cats.